The Jerusalem Marathon is one of Israel's largest marathons, with 30,000 participants, ranging from elite runners to the international runners of the world. Run against the backdrop of Jerusalem's cultural and historical landscapes, past sites such as Israeli Knesset, Machane Yehuda Marketplace, Mount Scopus, the Old City, David's Tower, Haas Promenade and more. Run through the streets where Kings and Prophets walked. It is guaranteed to be a challenging, thrilling and unforgettable experience for all runners. We attended, and took part, in the event in 2017 and can't describe how good it is. The atmosphere is brilliant, the organisation of the highest order and the city itself is stunning. You won't believe what an extraordinary marathon this is until you try it for yourself! Click on the image below for a sneak peak of how much you will enjoy the Jerusalem Marathon! The various courses pass by fascinating historical sites that illuminate 3,000 years of the history of Jerusalem, Israel's capital. Start the race near the Knesset building and run towards the Israel Museum, Israel's largest and most significant museum and the tenth largest in the world. From there, continue towards the center of town and savor the aromas of the nearby Machane Yehuda marketplace. After circling the Mount Scopus Hebrew University campus, run back towards the Old City, past the exclusive shopping mall and luxury hotel at Mamilla, the neighborhood that links the Old City with Jerusalem's new neighborhoods. Take in the historical architecture, narrow alleyways, and the sense of the ancient Jerusalem stone beneath your feet as you enter the Old City through Jaffa Gate. Behold the glorious Tower of David, part of the fortress built in the second century BC to protect the city. The sight of the ancient archeological City of David coming into view on the left is the perfect opportunity to hum a marching tune. Continue west towards Sultan's Pool, built over 500 years ago. This former water reservoir now quenches Jerusalem's thirst for culture with the many outdoor performances that it hosts. Next, you'll pass Mishkenot Shaananim, a cultural and international convention center that promotes tolerance and pluralism. Continue running towards the charming Emek Refaim neighborhood, built by the Templars in the 19th century and now a cultural hotspot for Jerusalem residents and visitors alike. Marathon 7:00am At the junction between the Knesset and the Israel Museum, Hamagbit Square on Rupin Rd. The marathon finishes at the southern end of Sacher Park. Runners and supporters alike are invited to visit the Expo at the Pais Arena and enjoy an electric athletic fair atmosphere, a variety of booths and stores, offering special discounts on sports apparel, accessories and equipment of the world's leading sportswear brands, fitness workouts in collaboration with Israel's top gyms, lectures and kits distribution. Get ready for the Jerusalem Marathon traditional Pasta Dinner! The pasta dinner is served the night before the marathon is the climax of the carbohydrate loaded diet that runners need to build up their glycogen stores before the race. The annual dinner has become an inseparable part of the experience shared by all runners in the 42.2 km race. All marathon runners are invited to join the traditional, festive pasta dinner on the night before the race. Enjoy a rich, diverse menu in an exciting, social atmosphere. It's a great opportunity to meet the people who will be running alongside you. Invitations are provided to full marathon runners only. You will receive your invitation with your running kit and will be asked to present it at the door. Others who wish to participate in the pasta dinner can purchase a ticket for 50 NIS at the location, based on availability. Guaranteed Entry and Accommodation Packages are now available for the Jerusalem Marathon. On arrival in Tel Aviv to hotel in Jerusalem and return: contact us for details. JERUSALEM DAY TOUR - $115 per person - Bus Tour with an English speaking guide. Depart Tel Aviv via the Judean hills to the Dead Sea, the lowest place on earth; Visit a Dead Sea cosmetic products shop. Drive along the shores of the Dead Sea to Massada and learn about the heroic story of the Jewish fighters. Ascend by cable car and tour the mountain fortress built by King Herod, where the Zealots of the first century made their last stand against the Romans. Visit the remains of the walls, palace, synagogue, water cisterns, mosaic floors, roman baths and other findings. Descend by cable car. Continue to the Dead Sea; Enjoy the unique opportunity to float in the Dead Sea and cover yourself with the mineral rich mud that many believe has its therapeutic effects. Return to point of departure. Depart Tel Aviv via the coastal road and the landscape of the lower Galilee to Nazareth, the town where Jesus spent his childhood. Visit the Basilica of Annunciation and the Church of St. Joseph. Continue, via Kana, to Tiberias, the lively resort town on the Sea of Galilee. Drive along the Kineret Lake to Capernaum and view the ruins of the ancient synagogue where Jesus taught; Continue to Tabgha and visit the Church of Multiplication of the Fish and Loaves with the beautiful mosaic floor. Proceed to Yardenit, the famous baptismal site located where the Jordan River flows out from the Sea of Galilee to the Dead Sea; Enjoy the peaceful and natural surrounding on site. Drive to Mount of Olives for a panoramic view of the city. Stop at Mount Zion to visit King David's Tomb, Room of Last Supper and the Dormition Abbey;Enter the Old City and walk through the Armenian and Jewish quarters to the recently excavated and restored Cardo, the Roman road. See the Jewish Wailing Wall, the Kotel, and continue to the Christian quarter. Walk along the Via Dolorosa and visit the Church of Holy Sepulchre. Continue to Bethlehem where Jesus was born; Walk through the Manger square to visit the Church of Nativity; View the Shepherds' field. Drive to Mount of Olives for a panoramic view of the city. Stop at Mount Zion to visit King David's Tomb, Room of Last Supper and the Dormition Abbey;Enter the Old City and walk through the Armenian and Jewish quarters to the recently excavated and restored Cardo, the Roman road. See the Jewish Wailing Wall, the Kotel, and continue to the Christian quarter. Walk along the Via Dolorosa and visit the Church of Holy Sepulchre. Drive through the Judean desert to the Dead Sea, the lowest place on earth. Stop to enjoy the opportunity to float in the Dead Sea and cover yourself with the mineral rich, therapeutic mud. Start the day with a magnificent overview of Jerusalem and the Judea desert from Mount Scopus. Drive to the Old City. Visit the Tomb of King David on Mount Zion; Walk along the Cardo, the ancient Roman road; View the remains of the wall of Jerusalem from the first temple period. 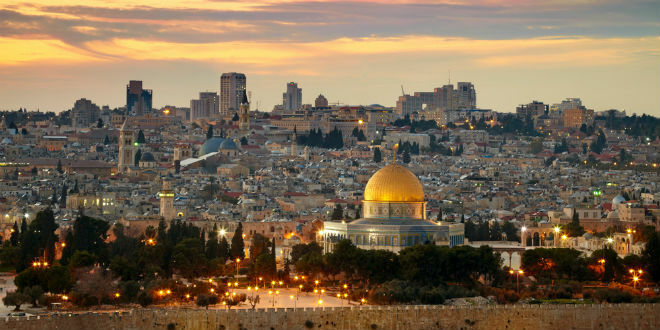 Visit the Jewish quarter, the Wailing Wall, the Kotel, and witness the Bar-Mitzvah ceremonies. Visit Davidson Center and tour the southern Kotel excavations. Stop to visit the Ammunition Hill, a former Jordanian army stronghold, converted into a national memorial site and museum. Drive to Mount Herzl, the military cemetery and Yad Vashem, the memorial to the Holocaust. Visit the Diaspora museum; Drive around the main streets of Tel-Aviv, center of business and entertainment of Israel; Also known as the "White City", Tel-Aviv was declared by UNESCO as a world cultural heritage site for its Bauhaus style buildings. Stop at Rabin Square, place of assassination of Prime Minister Yitzhak Rabin. Continue to Old Jaffa, one of the oldest port cities in the world; Visit the ancient ruins and walk along the Artist's Quarter. Visit Neve Tzedek, the first neighborhood of Tel Aviv, built in 1887 and Nahalat Benyamin, the pedestrian mall of the city where you can enjoy live street music, arts, crafts and handmade jewelry. Next, stop at Sheinkin, the lively and colorful street specially known with the unique shops, café life and youthful ambiance.